How Safe is Your Neighborhood Playground? We have turned the corner on the weather and every family relishes the time outside. While there are lots of reminders out there about pool and lake safety, did you know some of these facts about your local playgrounds? More than 200,000 children in the U.S. are treated in emergency rooms for injuries sustained in playgrounds. Children ages 5-9 are at the highest risk for playground injuries. 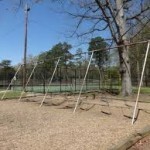 This is partly because they tend to utilize more dangerous equipment, but also because schools and day care centers often have dangerous playground components. The most dangerous playground components are slides in public playgrounds (they tend to be higher than home playground slides) and swings in home playgrounds. What can you do to protect your kids? The answer is a lot. See if winter played any havoc on your home playground. Inspect all aspects of your playground equipment. Check chains, be sure that no wood is splintered and make sure no metal is worn, rusted or sharp. Bring out your tape measure and ensure that you have enough spacing among playground components, especially between swings and other playground pieces. Your kids play in parks, at friend’s playgrounds and at their school playground. How safe are these places? We suggest you make it your business to inspect the places where your kids play. Check the grounds for any unsafe objects (sharp sticks, broken glass) and either remove them yourself or steer your children away from them. Check the area for standing water as well as insect hives. If the playground looks dirty, odds are that it is poorly maintained, too. No surfaces protect children completely from falls greater than 12 feet. Some surfaces (mulch, shredded rubber, pea gravel) provide more cushioning than asphalt, but children should never jump from inappropriate heights. Notice if the “big kid” equipment is separated from the “little kid” areas. If they are not, then you will have to be super vigilant when watching your kids to make sure they don’t inadvertently injure a smaller kid or if they are the little kids, that they don’t get hurt themselves. Make sure your kids utilize the playground appropriately. Just because it looks fun doesn’t mean it’s safe, no matter what the cushioning surface is. Have kids leave their backpacks, accessories (especially earrings and necklaces) away from the playground equipment while they play. 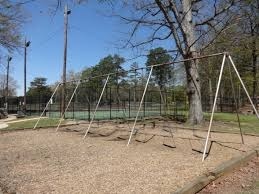 It is the responsibility of playground owners to maintain their playgrounds to ensure their continued safety. If your child has been injured on a playground, please give us a call.